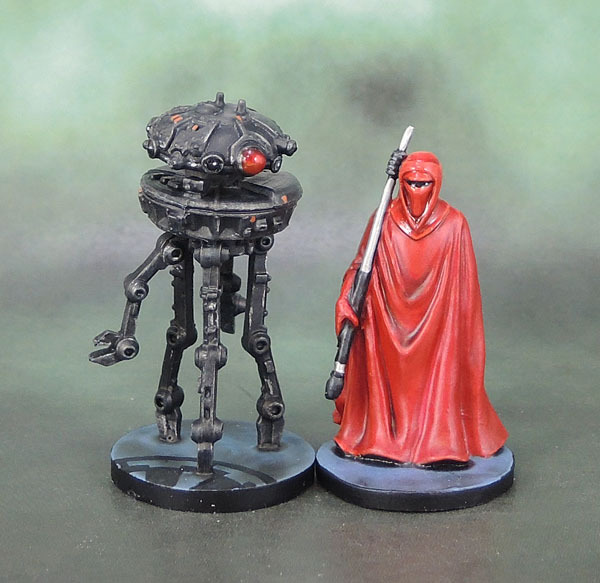 Star Wars Imperial Assault: Elite Probe Droid | Azazel's Bitz Box. 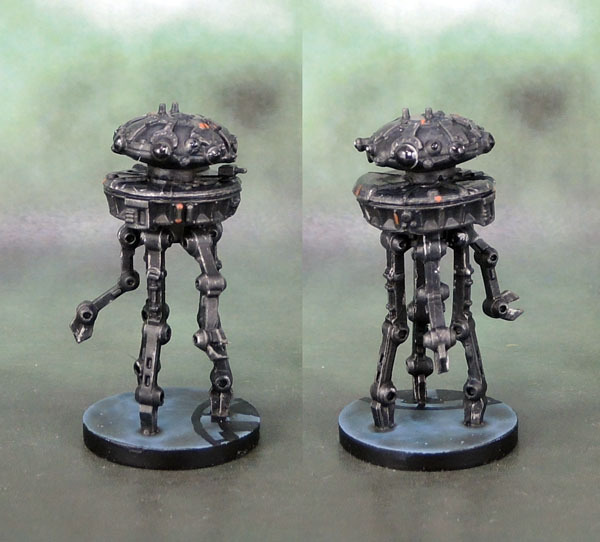 Today’s post is all about Imperial Probe Droids. 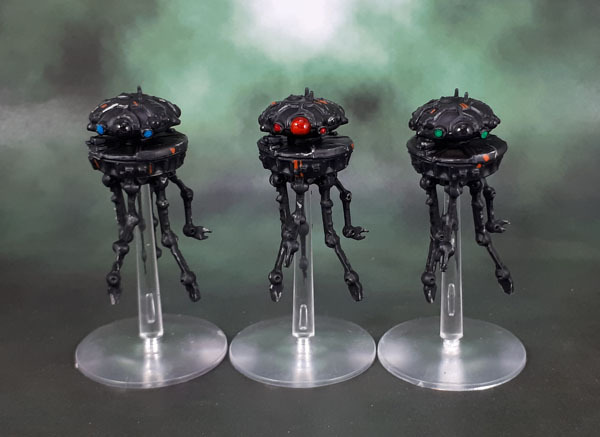 Regular visitors to the Bitz Box will be aware that I painted up a single Imperial Probe Droid from Imperial Assault last month. 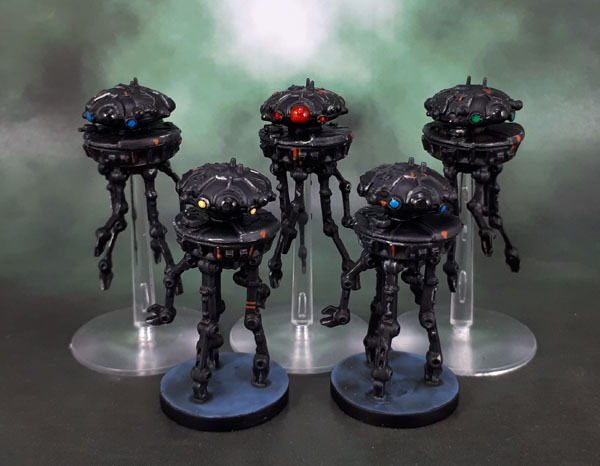 The reason I didn’t paint all three is because, well, all three of the Probe Droids were broken, right out of the IA box – one had one leg broken off it’s base, the next had two, and the third.. well, you see the pattern here right? Yep, it was broken completely and clear off it’s base. 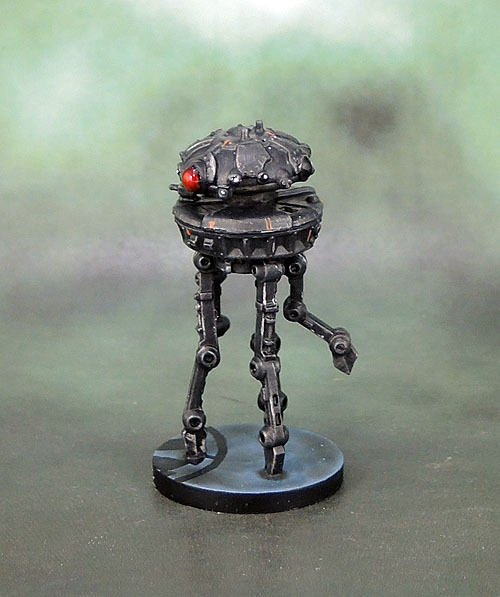 I contacted FFG, who were kind enough to send me out …a single replacement Probe Droid. So I contacted them again, with a bit of an “ahem – all three are broken, but you replaced only one.” – and resent the original photos. No problem, they said that they’d replace the other two, and in the interim, we started playing, and as the Probe Droids appeared to be a unit type that was turning up in every scenario, I painted that one model, so we could at least represent the elite with the proper model rather than with a T-800 Terminator model. Fast forward some time, and the others finally turned up, and I’d been thinking about mounting the broken ones on flight bases, which (I believe) Alex Faust also suggested. So last week, once Jewel of July was over, I got cracking on all five of them. Pretty quick to paint, all up. 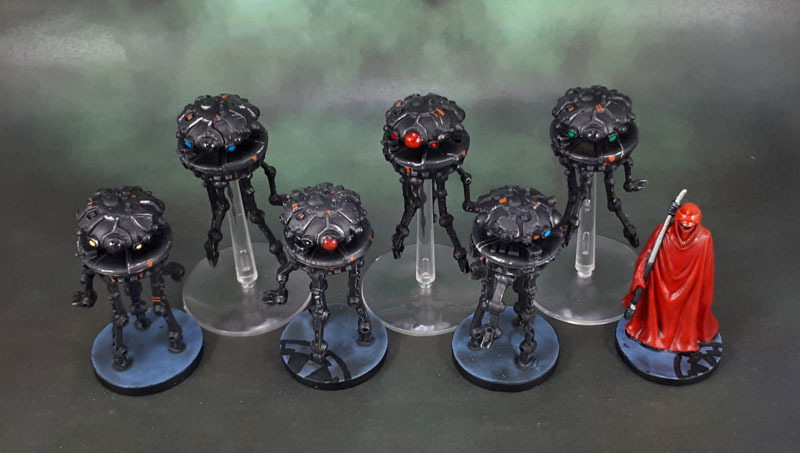 I ended up painting the secondary lights on them in different gemstone colours in order to differentiate them on the table. The Elite of course having the main lens in red rather than black. A few small details on them in burnt orange. I hadn’t noticed those details from the films, but all official models and statues of them from Kotobukiya, Sideshow and everyone else seem to have the markings, so I can only assume that they’re on the original screen-used props but didn’t end up visible in the films. The final shot here shows the five additional Probe Droids reunited with the originally painted one, along with an Emperor’s Royal Guard to provide scale. In a way, I think the formerly-broken ones actually look a bit better, raised on their flying stands, though they are also a lot more fragile in a way, held on by that little peg. I know I’m way behind on replying to comments here and keeping up with other people’s blogs. I’ll catch up when I can. Lots on IRL, especially with longer hours at work right now. Today’s post is another Star Wars one. We started playing Imperial Assault last week, and while we only got through the intro and first missions, it was quite a bit of fun. One of the enemies that the GM (Overlord? 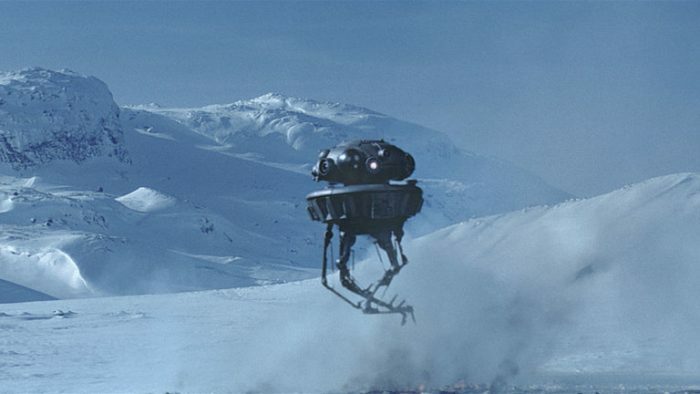 whatever) had in both missions was the Elite version of the Imperial Probe Droid. 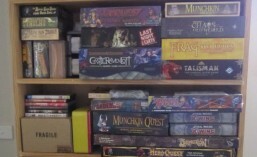 At the time, I didn’t know where my figures were, as the original three in my IA set were all (yes, all) broken, and FFG had sent me one as a replacement (which has been moved from its place on my desk). So we just used a Terminator model instead. Sure, wrong franchise, but it worked for game purposes. 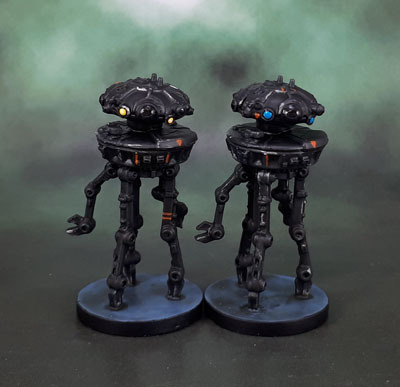 I noticed in images online that the Probe Droids have a fair few markings on them in a burnt orange, so I attempted to replicate the feel of those. The sculpt isn’t 100% accurate, so I couldn’t make the markings 100%, but the overall look and feel is pretty good. As with the Royal Guard, as an Elite mob I added the Imperial Cog to the model’s base. To make it even more obvious on the table, I chose to paint the main “eye” lens of the droid with a glossy red instead of the black. 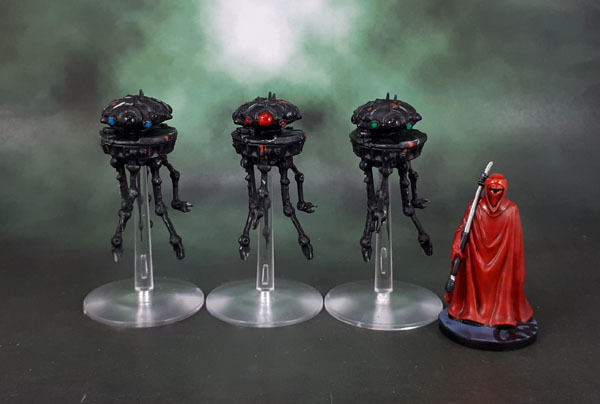 While I do think the cold black looks a bit better/more menacing as it gives off an alien or insectoid feel, it’ll make an easy point of differentiation combines with the cog, without doing something like red base rims. Ok, you convinced me. Good points made.